The Heat had extended an offer to Matt Howard, the undrafted forward who had fueled much of Butler's success in the NCAA Tournament the past two years, but he bypassed the bid. INDIANAPOLIS -- Butler men’s basketball standout Matt Howard (Connersville, Ind./Connersville) and women’s basketball star Kayla Tetschlag (Sheboygan, Wis./North) of Green Bay have been named the recipients of the Horizon League’s 2010-11 Cecil N. Coleman Medal of Honor. Howard was the unanimous choice on the men’s ballot, while Tetschlag appeared on every women’s ballot cast. The Horizon League’s highest individual honor, the Coleman Award is presented annually to the League’s top male and female student-athletes who best exemplify the dignity and high purpose of the League and its membership. The individuals demonstrate outstanding achievement in academics, athletics and extracurricular activities. Candidates must be seniors who have exhausted their eligibility and were participants on the varsity level in a League-sponsored sport. In addition, nominees must have a cumulative grade-point average of at least 3.00 on a 4.00 scale, or its equivalent. Howard becomes the 12th Bulldog all-time to collect the Coleman Award and the seventh on the men’s side. Howard joins Jody Littrell (1990), Chris Miskel (1996), Jon Neuhouser (1998), Brandon Miller (2003) and A.J. Graves (2008) as Butler men’s basketball players to capture the honor. Reportedly signed with Olympiacos In Greece. Howard started and scored 9 points on 2/3 shooting and 5/6 from the free throw line in addition to collecting 8 boards in 25 minutes of play. They lost 64-71 to FC Bayern Munich and are currently 7-19 in the league (second to last). Matt joined the team late in the season though and should do wonders for turning their season around (hence why he is already starting). Great to hear. I was overseas his Freshman year and in ACC country his Sophmore year, so I only got to see a handful of games. That said, I was able to follow the 09/10 and 10/11 seasons and I regret not being able to watch his first two years. He epitomizes what a scholar athlete should be and he deserves every bit of success that comes his way. There was an article in the Connersville paper a couple weeks ago, and it said that Matt planned to try out for a couple teams this summer, including the Suns. He mentioned that he didn't want to play in the D-League because it was too much one-one basketball and that wasn't his game. I'll try to find the article and paste it on here. Matt is on the Sun's summer league team. He plays Sunday at 3pm central on NBA tv, channel 216 for Direct tv. Howard will be in France this season (copying over what Staxawax posted on the other board). Matt's coach is not very bright. You actually get a short glimpse of Matt on the bench (foul trouble?) after his coach interferes with the play and give the other team the win. That's a hoot! Of course he is French. Howard's team is playing tonight in the Euroleague playoffs. Hope he and his team do well. Former Butler big man Matt Howard will be with the Memphis Grizzlies for Summer League. 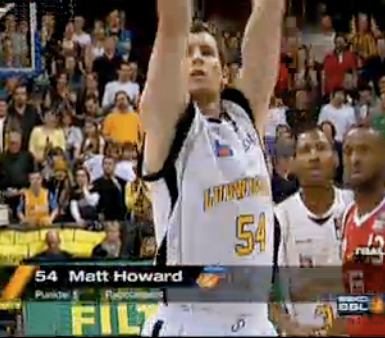 "Matt Howard, who is getting a shot with the Grizzlies after playing overseas the past two seasons. Howard finished with 11 points and 11 rebounds in 24 minutes of action." Any news on what Matt Howard is up to? He is a starter for a German pro team from Ulm, Germany. Last I looked he was averaging around 10 points/ game.